Super Bowl LIII is this weekend, and while it is the pinnacle of the NFL and arguably all of American sports, to many viewers, it's also a lot more. While one of the most discussed highlights of the NFL is typically the Halftime show, which will be headlined this year by Maroon 5, the commercials very rarely cease to entertain. Due to the amount of attention that the Super Bowl often receives, many new movie trailers will often air during the commercial breaks, typically with never-before-seen clips from their respective movies. While many Super Bowl commercials and trailers tend to try to surprise the viewers, there are at least a few trailers that we know about ahead of time. Here is every trailer confirmed so far to air during Super Bowl LIII, along with a few that are rumored. Right off the bat, we have Hobbs and Shaw, the Fast and the Furious spin-off starring Jason Statham, Dwayne Johnson and Idris Elba. In order to stay ahead of the game, given the competition, Universal Pictures already released the trailer for Hobbs and Shaw online a couple days back. However, we should expect the trailer that plays during the Super Bowl to be a much shorter version of the three minute trailer already released, as playing a trailer for three minutes during the big game would probably cost Universal somewhere around $30 million. Disney is estimated to be the biggest heavy hitter at this year's Super Bowl with their trailers. One of the big tentpole releases on the first half of Disney's 2019 schedule is their live-action remake of Aladdin. So far, this particular remake has been met with quite a bit of negative feedback, but the Super Bowl may be the perfect platform for Disney to change people's minds. Though there is no confirmation just yet, it is strongly rumored that Disney will be releasing a trailer for Aladdin at this year's Super Bowl, possibly giving us our first look at Will Smith as the Genie in something more than a poster. Wonder Park is a colorful animated feature from Paramount Pictures that will be releasing next month. While this particular animated movie hasn't received much publicity in recent months, Paramount is hoping to change this by giving it a Super Bowl trailer. The trailer is said to drop during the Super Bowl pregame show, so if you are hoping to see this particular trailer as soon as it airs, you may want to turn on your TV a bit before the game actually starts. Stranger Things has been one of Netflix's biggest hits in recent years, so there's no doubt that Netflix will try to market the next season of this sci-fi series as well as they can. While they've already released a couple of teasers for season three online, they've mostly just been cryptic audio over the updated title. The only real look at the third season has been a single poster released a few weeks back featuring a few members of the cast. Rumor has it that Netflix aims to release another teaser for the third season during the Super Bowl. If this is true, hopefully this particular teaser will have a bit of substance to it than what they've put out previously. Hulu has also had some success with their original series The Handmaid's Tale. At this time, Hulu does not even have a release date for the third season of this critically acclaimed series, but that doesn't mean they're not planning ahead. A teaser for The Handmaid's Tale season 3 Super Bowl trailer has already been released online, a decision that was more than likely made to avoid their trailer being lost in the mix of this weekend's competition. The third season is expected to release some time over the summer. Alita: Battle Angel is arguably this month's largest tentpole movie, so it would only make sense that 20th Century Fox would try to market it as well as they can. James Cameron and Fox have been trying to get this movie made since 2003, and have run into a number of issues over the past 16 years trying to get it finished, even having to push its original 2018 release date back last minute. 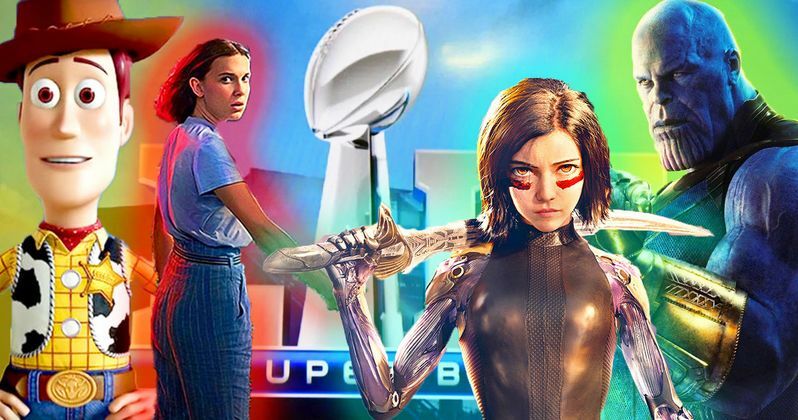 Fox definitely will want to make sure they get their money's worth for how much of a hassle this movie has been for them, so it's strongly rumored that Alita will be receiving a TV Spot at some point during the Super Bowl just to remind audiences that the release is right around the corner. Fox will certainly need all the help they can get with this one, as the initial reviews of the movie have been wildly disappointing. While Pixar has a number of hits under their belt, their greatest accomplishment still seems to be the Toy Story franchise, with the third installment to the series earning over $1 billion at the box office back in 2010. Disney and Pixar seem to have a large marketing plan for this fourth movie, already having released two teasers, with another trailer confirmed by the Toy Story Twitter page to release after the Super Bowl. Based on what Pixar has been marketing over the past week, it's believed that this new trailer will put a great deal of focus on Bo Peep, a character who has not been seen since 1999 in Toy Story 2. Typically, horror movie trailers don't air during the Super Bowl, as the movies tend to have a different target audience, but that all changed last year with A Quiet Place. Before Super Bowl LII, A Quiet Place was relatively unknown, but the trailer released during the Super Bowl practically blew up, leading to A Quiet Place becoming one of last year's biggest surprise hits. This year, Pet Sematary is expected to try to follow in A Quiet Place's footsteps with a Super Bowl TV Spot to tease the movie's April release date. So far, the marketing for this particular horror reboot has been quite underwhelming, so the Super Bowl may be the last chance for Pet Sematary to really stand out. This new action series from Amazon actually has a marketing plan that rides completely off of the Super Bowl. The Super Bowl trailer for Hanna has already been released online, and the first episode of the series will drop on Amazon Prime as soon as the game ends. This is actually a decent strategy by Hulu, as movies and TV shows that air right after the big game almost always tend to do well. The series is based on the 2011 movie Hanna that starred Saoirse Ronan and Eric Bana. One of the next big releases from Disney is the live-action remake of Dumbo, directed by Tim Burton. While there's still no confirmation from Disney if this particular remake will be receiving a Super Bowl trailer, it's strongly rumored that it will. Surely, if Disney releases a Super Bowl trailer for Aladdin, they will release one for Dumbo as well, considering that Dumbo will be releasing much sooner. While Marvel Studios has not yet officially stated whether or not a trailer for Avengers: Endgame will be airing during the Super Bowl, a number of sources have come out across the Internet claiming that we will be seeing one. Having a trailer drop during the Super Bowl for Marvel's April/May release is practically a tradition, with The Avengers, Iron Man 3, Captain America: The Winter Soldier, Avengers: Age of Ultron, Captain America: Civil War, Guardians of the Galaxy Vol. 2, and Avengers: Infinity War all receiving one in years past. Very rarely does Marvel break a formula that works, so a new trailer for Avengers: Endgame is practically guaranteed, even if Marvel won't admit it just yet. Last year, Black Panther received a Super Bowl trailer a month before its release, and it went on to become the biggest movie of 2018 at the domestic box office. Because of this, Marvel is expected to repeat this method with Captain Marvel, which releases in the same slot as Black Panther did last year. While there's no official confirmation yet, or any other sources confirming that Captain Marvel will receive a Super Bowl trailer, it seems incredibly unlikely that this particular hero will not receive a trailer during the big game. Lionsgate confirmed late Friday night that fans would be getting to see the first footage from the Guillermo Del Toro produced kid-friendly Scary Stories to Tell In the DarK during the big game. The news arrived with the first poster, which reveals Howard the Scarecrow for the first time. Chances are we'll get to see Howard and several other wicked delights while we're scooping big Fritos full of guacamole into our mouths. Let's hope the trailer isn't as scary as Guillermo Del Toro has teased, we wouldn't want anyone chocking to death from the frights. At this time, these are the only known movies and TV shows that will receive marketing during Super Bowl LIII, but there are more than likely a few other movies that will be marketing during the big game that are trying to keep their trailer drops secret. According to Deadline, both Sony and Warner Bros. are sitting this year out, so don't expect to see any trailers for movies like Shazam, Spider-Man: Far From Home, Men in Black International, Zombieland 2, It: Chapter 2 or Detective Pikachu.